Even as we reflect on this past year with friends and family, we are making plans for the next year, with barely a break in step. We are all too aware of those who are experiencing hard times and all forms of injustice, and many have spent their holidays assisting migrants and others, sharing contributions and material goods. Throughout the year, in fact, so many people stepped forward to protest and to provide direct support in the face of injustice. NNIRR is especially grateful for the support we have received throughout the year. All financial donations, whatever their size, have helped to grow and sustain our operations and activities during this chaotic time. This New Year's Eve, there's still time to include NNIRR in your year-end donations. 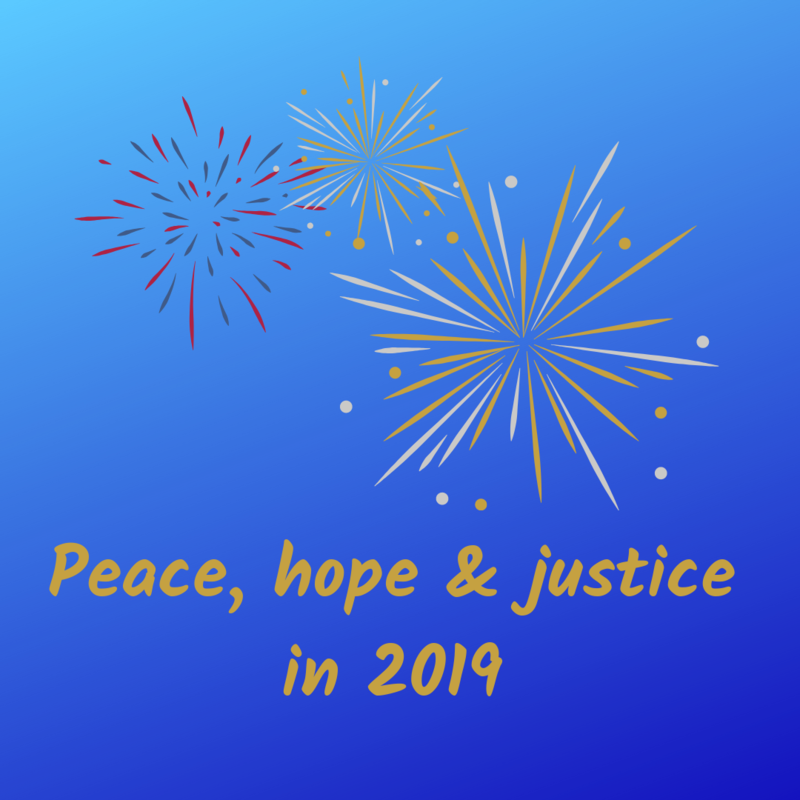 Your support helps us to move a human rights agenda, make durable connections, and provide strategic opportunities for coordination and movement-building. Thousands of asylum seekers -- including children -- from Central America have been stymied in their attempts to seek safety and survival in the U.S., just as many who have been allowed to enter are being stranded outside bus stations or are being kept in "temporary" facilities, including tents cities. Further militarization of the U.S.-Mexico border with an ongoing fight over funding for the wall, operations and technology, in addition to the "wall" of policies to deter immigration. Keep in mind the more the thousands of military and National Guard troops sent to the border to “support” border enforcement agents against the so-called “invasion” of migrants and asylum seekers. Over 300,000 TPS (Temporary Protected Status) recipients -- immigrants from countries deemed unsafe by the U.S. State Department -- may face deportation as the Trump Administration has systematically denied renewals of TPS. A court injunction in October has temporarily blocked the Administration from ending TPS for some countries. Changes to “public charge” rules could limit access to permanent residency, and effectively limit immigrant access to public support programs. Many children remain separated from their families, while the Administration seeks ways to further detain families, perhaps indefinitely. Almost 800,000 Deferred Action for Childhood Arrivals (DACA) recipients face an uncertain future, in spite of legal challenges that have prevented the Administration from ending the program. A lawsuit is challenging the Administration’s attempt to limit access to asylum in defiance of U.S. and international laws. Trump wants to end birthright citizenship, enshrined in the 14th Amendment to the Constitution, to satiate a long-standing demand of White supremacists. Refugee admissions to the U.S. have been drastically reduced -- just 30,000 set for FY 2019. Only 22,491 refugees were resettled in FY2018, well under the previous quota of 45,000. White House proposals persist to eliminate family-based immigration and cut overall numbers of legal immigration. A “citizenship” question may be added to the 2020 Census, a move that could inhibit immigrant households from participating in the Census. With expectations of early campaign launches for the 2020 presidential elections, immigration issues are likely headed towards greater polarization in 2019. And with a new -- and divided -- Congress, we can expect some interesting developments. We'll need to step up our challenge to hate and division, repressive and inhumane policies! Please give generously to this year-end appeal with a donation online or through the mail. Monthly or quarterly sustainers help us throughout the year and spread a total donation through multiple payments over the year. Thanks again for your support, and best wishes in the new year!